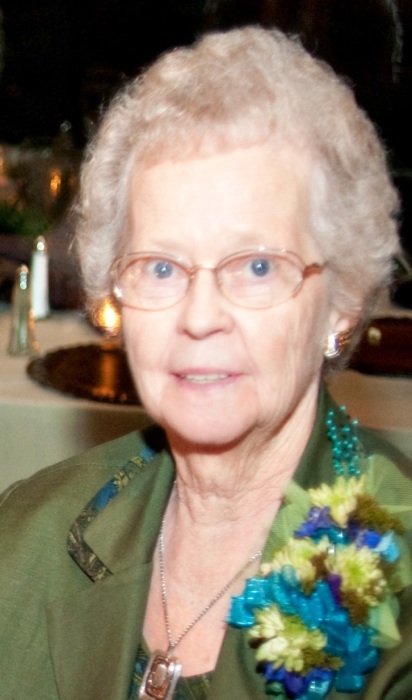 Marlene May (Amonson) Jorgensen, 86, of Eagle Grove, Iowa passed away on November 19, 2018 in Arlington, Texas. Memorial services will be 1:30 p.m. Saturday, December 8, 2018 at Samuel Lutheran Church in Eagle Grove. Burial will follow at Rosehill Cemetery in Eagle Grove. A visitation will be from 5:00 p.m. to 7:00 p.m. Friday, December 7, 2018 at Foust Funeral Home in Eagle Grove. Marlene Jorgensen was born on February 8, 1932, in Eagle Grove, the daughter of Omer and Bernice (Johnson) Amonson. She was raised and educated in Eagle Grove graduating from Eagle Grove High School with the Class of 1950. On May 1, 1955, Marlene was united in marriage to Duane Jorgensen at the Little Brown Church in Nashua, Iowa. To this union one daughter Patricia Ann and one son Scott Duane were born. For approximately 30 years, Marlene celebrated her birthday on February 7th. When Marlene was approximately 30 years of age, her Mother found Marlene’s original birth certificate and it was discovered that she was born on February 8, 1932 and also learned that Marlene’s middle name was spelled May and not Mae. Marlene worked for Iowa Public Service for approximately two years during the 1950s. She also worked for Ellsworth Freight Lines from 1974 to 1988 when the company closed. Marlene was a member of the Samuel Lutheran Church of Eagle Grove. She volunteered to be a Girl Scout leader in the 1960s and also volunteered to deliver Meals on Wheels in Eagle Grove. Marlene and Duane were husband and wife and “best friends.” They truly enjoyed spending time together especially collecting soda cans for redemption around Eagle Grove. Marlene is survived by her daughter, Patricia Grandgeorge and her husband Ronald of Papillion, Nebraska; her son, Scott Jorgensen and his wife Mary of Grand Prairie, Texas; two grandchildren, Jamie (Jorgensen) Pennington and husband Drew of Dallas, Texas and Matthew Jorgensen and wife Lorin of Irving, Texas and two great granddaughters, Charlie Marlene and Holland Helen; one brother Lyle Amonson and wife, Gwen, one sister Jean Jorgensen all of Eagle Grove and many nieces and nephews. She was preceded in death by her parents; husband, Duane in 1987; two brothers, Orin and Richard Amonson; sister Bernadine Tuttle, and great niece Jamie Tuttle. She was also preceded in death by brothers-in-law, Howard Tuttle and Rod Jorgensen and sister-in-law Lila Amonson. In lieu of flowers, memorials may be given to Samuel Lutheran Church and Eagle Grove Meals on Wheels.